Arduino Day 2016 is coming ! Genuino Day 2016 is coming ! Arduino is an open-source prototyping platform based on easy-to-use hardware and software. Arduino boards are able to read inputs – light on a sensor, a finger on a button, or a Twitter message – and turn it into an output – activating a motor, turning on an LED, publishing something online. You can tell your board what to do by sending a set of instructions to the microcontroller on the board. To do so you use the Arduino programming language (based on Wiring), and the Arduino Software (IDE), based on Processing. Arduino Day is a worldwide celebration of Arduino’s birthday. It’s a 24 hours-long event –organized directly by the community, or by the Arduino team– where people interested in Arduino get together, share their experiences, and learn more. Not sure what on Earth is Arduino? Find out at our event or visit http://www.arduino.cc. Introduce newbies to the world of Arduino boards and their exciting possibilities. Newbies will have a hands-on experience at it ! Enable existing users of Arduino boards to showcase their Arduino projects. Grow an Arduino community in Vietnam and connect it with the global Arduino community. If you want to showcase your own project or propose an activity, please register now at https://goo.gl/xdpumu. We will help you organize your activity as best as we can. Drop us a message at [email protected] if you need us prepare something. Talks, Workshop, Introducing your project or event just a idea are welcome. We also need 3 volunteer for the event. If you want to be a part of us, send your CV or cover letter to [email protected] now. Be quick and grab your ticket at Ticketbox ! The event is also featured on Facebook here. Share us what you want to see to help us organize this day better. All day event and workshops are pay-what-feels-right. At the event you will be invited to pay the amount that you feel is right for your participation. The money will go to support the Fablab community and similar initiatives. For the workshop, seats are limited. If you want to attend, you should bring your own laptop. If you would like to showcase your project on that day, contact us at [email protected] or send us a Facebook message at https://www.facebook.com/FablabSaigon. Slots are very limited, so hurry up! Actually we have to use the phrase “Genuino Day” instead of “Arduino Day”. But people are very common with the phrase “Arduino” so we decided to use the phrase “Arduino Day”. We will explain this clearly in the introduction talk of the event. We will use the phrase “Genuino Day” in 2017 and further time. 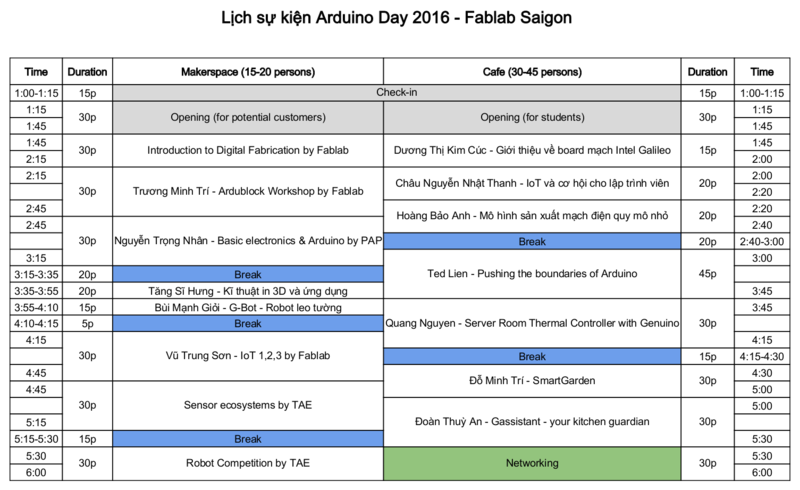 This entry was posted in News and tagged Arduino, arduino day 2016. Bookmark the permalink.